The crowd was mixed in gender, age, and income. We were particularly impressed by the number of young families and young adults in the crowd. The numbers continued to increase over the entire weekend, with a crowd that filled most viewing areas by the start of the race. Mosport officials have to be happy with the turnout, as every section that had a decent viewpoint had people standing at the fences. It reminded me of the crowds that used to come in the mid-seventies for Can-Am and Formula 1, but less prone to destruction and hooliganism. One fan even brought his satellite television receiver, so we were able to watch the Hungarian parade, as well as tuning into NBC's coverage of the race during critical moments (such as finding out if Emmanuelle Pirro was ok). For qualifying on Saturday we made our way to Moss corner, and were impressed with the crowd. It was probably double the population of the crowd at the same time last year. I would guess that 30% was straight rise in attendance, while the remainder could be attributed to the improved access via the Continental Tires bridge at turn 4. Saturday had, among other things, the driver autograph session, which drew a healthy crowd – to the point that the fans had to be directed to one of three tables, and once they had collected the signatures at that table, they had to return to the back of the line! One fan (I use the term loosely) showed up at Pirro’s seat and brought out about two dozen models to be signed. Mosport officials finally stepped in and had him move along. One thing we noticed was that the exit from Moss corner the pavement had been replaced overnight Saturday night. I guess the high temperatures all day with the bonsai qualifying of JJ Lehto and Johnny Herbert really tore the pavement up. It was warm and dark as the cars took to the track Friday afternoon. The rain finally arrived midway through the combined session, and a parade of red flags began. 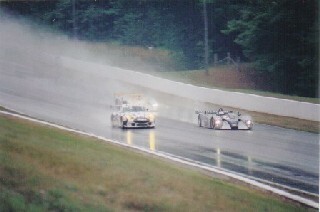 Since Mosport has a history of drawing rain, all the teams did their best to get some wet weather running in at speed, with predictable results. 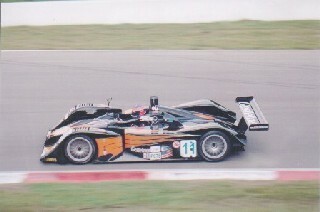 For the most part the cars weren’t severely damaged, but Jan Magnussen rather hurt his Panoz in Turn 9. 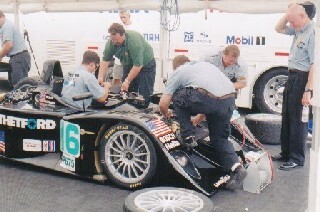 The Intersport Lola B2K-10 was getting light and squirrelly after the rise on Andretti straight. With the beautiful high-pitched whine of the Judd, it was obvious that Mark Neuhaus was lifting in order to get the car settled. There are two places you don’t want to lift at Mosport, if you want fast times, and this is one of them. (He was lifting at the other, turn 2, during the race). Clint Field was obviously more comfortable with the car’s twitchiness, as he kept the pedal mashed the full distance of the straight, and was much quicker at turn 2 as well. You could see him fight the steering wheel, though – which must be unnerving at 180 mph. Archangel did not practice until Saturday morning that I noticed. For qualifying, we made our way to Moss corner. As mentioned before, the access was greatly improved, and the crowd was quite large. I think Mosport may have to consider removing the large sign that shows up in the in-car camera, to restore part of the natural amphitheatre at this turn. There were a couple of shows worth watching during the two sessions. One was the Ron versus Terry show, with the two setting hot lap after hot lap. Finally Borcheller had a hot run with little traffic right at the end of the session, and came upon Ron’s slowing Corvette towards the end of the lap. Ron moved well out of the way, and lost the pole as a result. This was talked about extensively over the PA system, with Terry pointedly thanking Ron. The AVR Vipers were looking quite fine, but the difference in drivers was quite apparent on the exit from Moss corner. While Tom Weikhardt was fighting the steering trying to get the power down, Marino Franchitti would just point and shoot. The difference in the end was over a second a lap. The good news was that all GTS cars outqualified the fastest GT. 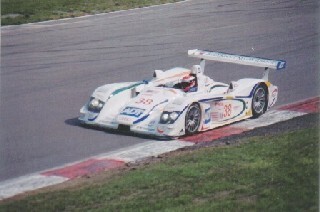 JJ Lehto put in some lightning quick laps early in the LMP session, and Johnny Herbert answered late. It was apparent with the commitment the two showed through turn 5 that they were using all they had. Just when Dyson was prepared to go for a pole position, they had problems. While everyone has reported that these were due to the throttle linkage sticking, James Weaver was also switching on and off the power, so we were speculating that maybe some of those electrical gremlins we’ve seen at Le Mans and Sears Point were involved as well. Intersport and Knighthawk seemed to have little trouble with skipping in turn 5, but the Archangel Lola was dropping its nose to the pavement with every gear change. This would continue throughout the race. At the start, JJ Lehto passed Stefan Johansen and was nose-to-tail with the Biele Audi. The cars would fly in formation for the better part of an hour, with Lehto actually running second for a period in the second hour after a good pit stop got him out in front of the #1 Audi. 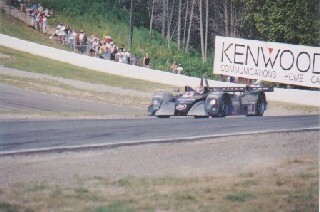 The best lap times say the Collard Cadillac had a faster lap than what Lehto turned, but Lehto did his best lap in Lap 51, while most other cars turned their best laps toward the end of the race. It just goes to show that JJ still has it. It took James Weaver longer than anticipated to carve through the field and catch the other MGs. He never did get close enough to challenge overall. His best lap was 1.7 seconds off Lehto’s best, so he was probably only up to 1 second off their pace at the time (lap 28). A fortunate early yellow closed the field up after he had cleared all the GT(S) cars, and he and Claudia Hurtgen ran very tightly until a bit of fluid started appearing out of the tail of the Thetford MG. Sadly, both drivers had overextended their motors, and Steve Knight only turned a handful of caretaker laps before the Knighthawk MG dropped out as well. 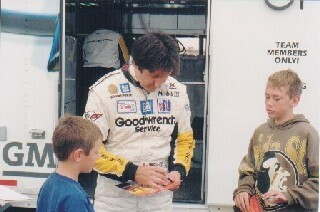 In GTS, it became apparent that Ron Fellows and Terry Borcheller would settle the race early, and Ron bested Terry early and kept his Corvette just in front until driver changes. Another nice result was that the AVR Vipers finished ahead of all GT class cars bar The Racers Group’s winning #66, which headed Tom Weikhardt. I like Ross Bentley, but the Essex Lola was really getting in the way out there. The point where Tom Kristensen finally put Johnny Herbert down a lap, at the end of the Andretti straight, happened because they came upon the Lola and Herbert had to go around the outside, as the Lola (with Melanie Patterson driving) was on the line. TK forced his way inside, and passed both cars at the same time. Had Johnny held that advantage, he would have gained his lap back when the final yellow came out. It’s unlikely he’d have challenged TK over the last fifteen minutes, but at least an opening would have existed. 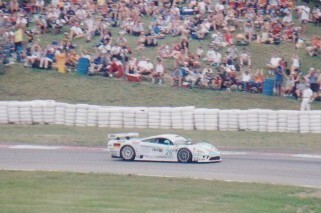 Having never driven Mosport (excepting in Sportscar GT), I can only judge drivers’ skills from the fan’s perspective. Turn 2 is the most daunting corner on the track, and the urge to lift must be powerful. Teo Fabi once said that getting the track record was easy, if you got through Turn 2 without lifting or touching the curbs. 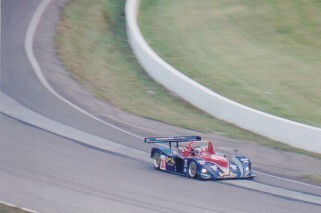 That said, Mark Neuhaus in the Intersport Lola B2K-10 was not comfortable at all coming through the turn, and at times was almost as slow as the Essex Lola. Clint Field, on the other hand, drove it with authority. He looked as comfortable as the Audis and Cadillacs through this corner. The accident that caught out Sascha Massen looked to us more like a suspension failure than an oil problem – but, since he was able to finish the race, and the team isn’t saying different, it has to be assumed that the suspension was ok. Not that there was any shortage of oil on the track at that point. We saw a few cars blowing moisture towards the end of the race, including the Racer’s Group #67 car. The drivers could be forgiven for not knowing about the lack of traction, as the communication between marshalling posts at this time was spotty at best. It took about four laps for the hazard flag to come out. The great thing about this racing is the access fans have to those who brought the cars. I was able to talk to Rob Dyson during practice Saturday morning, and he told me what he told Tom – “We aren’t interested in how the other MGs are doing. We’re 3 seconds off the pole, and we have a lot of setup still to do.” Chris Dyson was a busy boy, helping the team in ways he’d rather someone else did while he prepared to drive. He was sorely disappointed, judging by his face, but took it like a pro. He’ll get to race this car in anger soon. I had convinced a friend to bring his two boys, 12 and 8 years old. 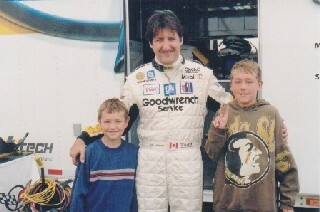 Last year they saw the trip as camping with their father at Mosport. 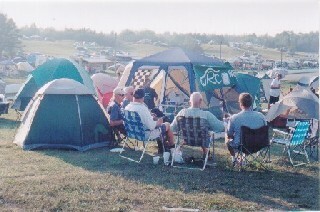 This year they were just as interested in Mosport itself. We then went to the paddock and looked at the cars. The garage tent for Corvette had some half-fences to allow the autograph hounds to hang on and wait for Ron Fellows to cruise by and sign stuff, but we had just missed him when we arrived. Robin Pratt was coming by, and I asked her whether we might entice Ron back for a photo. Instead, she led us back into the back area, and had us pose with Ron at the entrance to the trailer, after which he signed some promotional cards for the boys. They then ran out, bought Corvette hats, and cheered like crazy for #3. You’ve got to get them when they’re young. A big thank you goes out to Robin and Ron for being so accommodating and downright friendly.